For the last couple of week we’ve been busy in the studio with re-organisation our subtitling department in order to deal more efficiently with high volume Arabic subtitling projects. Our main objective was to be able to streamline our process while complying with our clients’ requirements and without compromising quality. We are proud to have clients from all over the world who work with us. However, having many clients means that we needed to cater to different requirements and hence our subtitling set-up had to be both reliable and flexible. As a result, my team and decided to invest in two different systems; Mac and Windows. I’m not gonna get into the spec details of each but let’s just say that both systems are equally powerful. And since both operating systems are completely different, we had to have two different subtitling set-ups using a couple of different software. After weeks of research and countless demo trials we opted for the below set-ups which i recommended to anybody who is looking to work with Arabic subtitling projects. – EZ Titles is a great tool that generate multiple subtitling file formats. We opted for SubRip (.srt) since it is the most common. – Avid Media Composer to be able to burn and export the final subtitled movie in a variety of formats especially for TV broadcasting. We usually export our movies compressed as Quicktime using the MPEG-2 50 mbit codec which is a TV PAL standard. 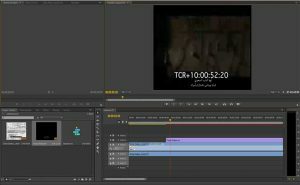 – EZ Titles Plugin for Avid Media Composer has an extended support for Arabic script and is very easy to use. – Annotation Edit is a versatile subtitling tool that is very easy to use. We gave it a test run and thought it was quite powerful. – Final Cut Pro X is also very user friendly and is packed with all the codecs needed to export movies for broadcasting. We usually compress our movies as Quicktime and use the MPEG IMX 50 coded for TV PAL. It took us a while to decide on our Arabic subtitling set-ups but we are confident that we made the best choices.